1. In parts of England there is intense competition for primary school places with too many pupils competing for too few school places. Current projections show that this situation will only grow worse over the next few years. 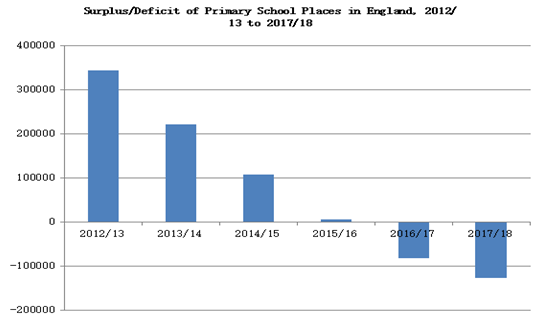 Although there is currently a national surplus of primary school places, by the academic year 2018/19 three fifths of local authorities are expected to have a shortfall of primary school places. In the longer term there will also be a shortfall of secondary school places as these children progress through the academic system. The problem currently being experienced in parts of the country – and which will be felt more widely in the future - is due to the rising birth rate, which is overwhelmingly the result of a rise in births to non-UK born mothers. 2. Since 2002 there has been a marked increase in the number of births in the UK, with 2012 having the highest number since 1972. This increase in births is primarily as a result of an increase in births to non-UK born mothers with 78% of the increase since 2002 attributable to them, with the remainder coming from an increase in births to UK born mothers. Immigration is therefore having an impact on the increase in births. 3. In 2013 there were a recorded 779,000 births in the UK of which 25% (197,000) were to non-UK born mothers. This compares with 669,000 births in the UK in 2002 of which 17% (110,500) were to non-UK born mothers. Figure 1. 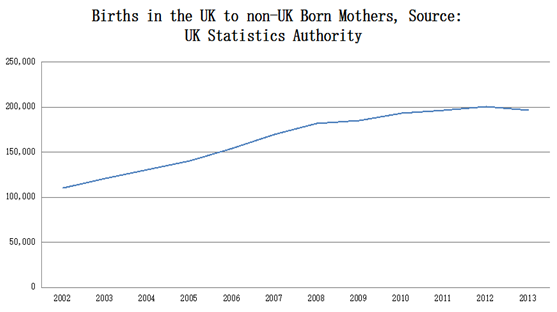 Births in the UK to non-UK Born Mothers, 2002-2013, Source: UK Statistics Authority. 5. In addition, there is a smaller impact on school places from the international migration of school age children. Net migration of under 15s has been estimated at an average of 10,000 per year between 2002 and 2013. 6. Although there is currently a national surplus of primary school places, there are some areas that are already experiencing shortages. London, in particular, is experiencing a high level of demand which will only be exacerbated in the future. In Greater London there are currently 646, 000 pupils in primary schools, however it is estimated that by the academic year 2017/18 there will be 768, 000 pupils in the capital’s primary schools - or 122,000 more pupils than there are now. There are already numerous oversubscribed schools in London. Other areas of high demand include Birmingham, where the number of places needed by 2017/18 is predicted to be 115,000, an increase of 15,000 from the current 100,000. In Manchester, the number of school places is predicted to increase to 52,000, up from the current 40,000. In Kent, the number of places needed is predicted to increase by 10,000 from 111,000 to 121,000. 7. Indeed, the number of local authorities set to experience shortfalls will grow significantly. The Local Government Association has highlighted that two in five local authorities in England will be experiencing shortfalls in primary school places by the academic year 2016/17, more than half by the academic year 2017/18 and three in five by 2018/19. 8. In London two thirds of births are now to parents where one or both was non-UK born. 9. There are currently 4.416 million primary school places in England and 4.011 million pupils on school rolls which means there are 434,000 unfilled places. At the moment the number of unfilled places as a percentage of total places is 9.8% However, the number of children entering primary schools is growing rapidly and it is estimated that by the academic year 2017/18 there will be 4.572 million children in primary schools, leaving a deficit of 155,000 primary school places. 10. 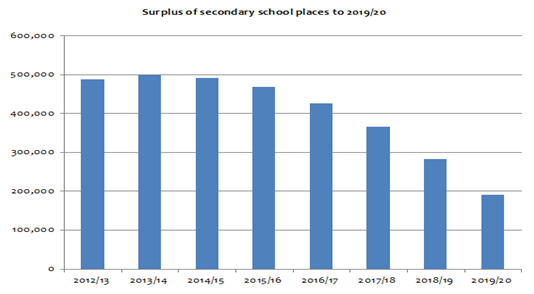 The situation regarding secondary school places is slightly different, but the underlying trend is exactly the same; sooner rather than later there will be a deficit of secondary school places. The current number of secondary school places in England is 3.637 million while the current number of pupils is 3.191 million. This means that there are over 450,000 places currently unfilled. The number of unfilled place as a percentage of total places is currently 12.9%. There are forecast to be 3.446 million secondary school pupils nationally by the academic year 2019/20, 300,000 more than there are currently. However, this is 190,000 fewer than the number of places as figure 4 demonstrates. It is clear that the number of pupils will outstrip the number of places in the longer term although there is time to remedy the situation to avoid a shortage. 11. The Local Government Association has estimated that in the next ten years, there will be an additional 900,000 pupils (primary and secondary) at England’s schools and that this could cost £12 billion. School places are funded through a combination of funding from the Department for Education and Local Government. 12. The LGA found that funding from the Department for Education had so far not met the full cost of providing school places and will not meet that cost between 2011/12 and 2016/17. When surveyed on the matter 77% of local authorities that responded to the LGA said that they had not received sufficient funding from central government. This had led to councils having to find money from a range of other sources in order to fill these funding gaps and this included greater borrowing. Around half of councils had reported using funds from other school capital programmes such as school building maintenance to create new places. According to London Councils, a body representing local authorities in the capital, London in particular will require additional funding due to it being the most affected part of the country. 13. In the last ten years there has been a marked increase in the number of births, with 2012 having the highest number since 1972. This increase in births is primarily as a result of immigration to the UK with over three-quarters of the increase since 2002 due to a rise in births to non-UK born mothers. 14. As Figure 5 below shows over a quarter of births in England and Wales are now to non-UK born mothers. Figure 6. Number of Births in the UK to non-UK-Born and UK-Born Mothers, 2002-2013, Source: UK Statistics Authority. 15. It is the increase in births to non-UK born mothers, as well as the growing number of school aged migrants that has created the shortage of school places in England. This is a problem that is only going to grow worse in the future.